I never learned chess. It’s just one of those things that passed me by, and also seemed to be a game that required hours of dedication to learn, along with complete concentration. And any time I had for complete concentration was given over to reading. It is still true that hours of dedication are needed to be good at anything, especially chess, but this book teaches the basic moves and principles in a single sitting with the simplest of instructions. And what’s more, it inspires by teaching the rules of chess through telling a story. The Foolish King: The Secret History of Chess reads like a fairy tale. It tells the tale of the kingdom of Stur and its king, King Marra, but particularly his passion for gardening. King Marra’s extreme care and dedication to the land translates into prosperity and growth. But like all kings and commoners, eventually he grows old and dies, and after his death, there must be the accession of a new king. King Parip hates the land and his garden and he likes to play mean tricks on the insects that inhabit it, and so eventually the kingdom goes into decline. Price uses the idea of insects populating gardens to teach the game of chess. Rather than the chess pieces being Kings, Queens, rooks, bishops, knights and pawns – Price introduces the idea of insects instead. So for example, ants or bees are the pawns (both insects known for protecting their queens), and grasshoppers or crickets are the knights (these insects can jump or hop!). Two children in the story, Holly and Pip, are taught the game of chess by the insects in the garden, and in turn, and in a desperate race to save their kingdom and all its land, they teach the game to King Parip. You might ask why teaching the new king the game of chess might lead to a happy resolution to the story, and allow the garden to grow again and the land prosper? Price cleverly interweaves the motivation for chess into his story – explaining that the day and night insects decided to play a game rather than just fight each other for the food at the short time of day when both nocturnal and diurnal insects were awake. 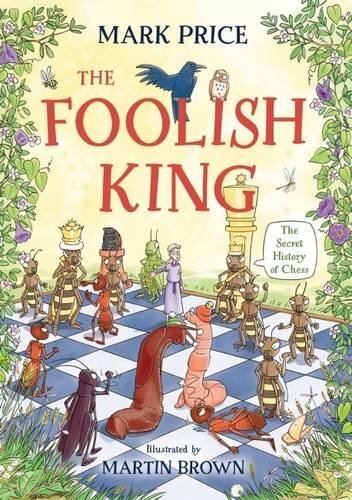 In the same way, Pip and Holly teach chess to King Parip and it encourages him to be more patient and thoughtful, which in time stimulates growth in himself, and encourages him to see the advantages of insects in a garden and their contribution to a land of prosperity. What’s clever about the book is that there are practical exercises in the middle of the story – practice boards (with answers at the back) that teach the reader how each piece moves, one by one – so that before starting to play the game, the moves are completely stuck in the reader’s head. Then a real game between the children and the royal insects is shown step by step, with speech bubbles explaining motivation behind each move. The children characters are identifiable for the reader, and the whole book is brought delightfully to life by the humorous and frankly brilliant illustrations from Martin Brown (best known for his Horrible Histories illustrations). Ants shaking their fists, an insect chessboard stadium – complete with spectator stands, and some very self-important insect royalty. This is a colourful, lively, and well-explained way to teach chess, and if it can teach me the basic principles, it can definitely teach your six year old. Buy the book here. There’s also an accompanying app, available free from ITunes for Iphone and Ipad, which teaches chess to children aged six and over. The user can play against the computer or against a friend on the same device. The app also provides tutorials to support the book, featuring the same illustrations. On Christmas Eve 2016, a new website launches, on which users can play chess games online and climb onto the leaderboard. You can sign up here.